In January, ABA President and CEO Katherine Lugar joined the U.S. Conference of Mayors for their annual winter meeting in Washington D.C. to announce the Childhood Obesity Prevention Awards. This year's 1st place winner in the medium city category goes to Mayor Levar Stoney's "Fit4Kids" program based in Richmond, Va. The program, formed in 2010, was founded specifically to combat childhood obesity, by integrating kinesthetic strategies and wellness into the classroom routine. It is currently serving 10,000 children in the Richmond region, and 99 percent of teachers reported that they plan to continue wellness activities for their students next school year. 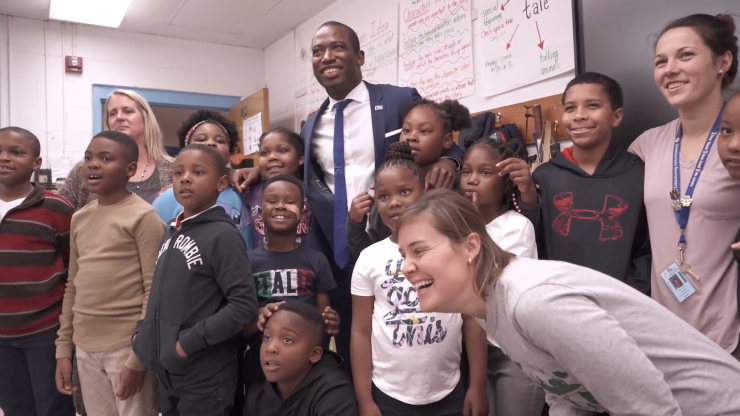 "This wonderful grant will allow us to reach in some of our communities that have been long marginalized and left behind, and ensure that they get the same healthy lifestyle as anyone else in our city," said Mayor Stoney. Since 2012, the USCM and the American Beverage Foundation for a Healthy America have joined together in a public-private partnership to support programs like "Fit4Kids" to help combat childhood obesity. Thanks to the hard work of Mayor Stoney, youth in Richmond have the opportunity to be active in the classroom. Read more about the program here.